Living a healthier and leaner lifestyle is a big priority for most of us these days. As nutritional scientists and dieticians discover more and more ways to achieve optimal health, we continue to experiment with their new ideas in search of long, lasting results. One of the leading trends in healthy living today is juicing and blending. Should I buy a Juicer vs Blender? Although both methods can potentially make your body happy, juicing and blending are very different from each other. Before you make any purchases in this department, it’s important to know your body’s needs and desires. This article will outline the juicing vs. blending debate so that you will be able to make a much more informed decision. What is the Difference between a Blender vs Juicer? A juicer’s main objective is to extract only the fluid and nutrients out of your produce and other fresh ingredients. The juicer separates the liquid matter from the solids; therefore, the fibrous or pulpy remains are discarded and not consumed. All that remains then after juicing is a purely liquid juice drink. A blender’s main objective is to simply break apart the entire produce material or ingredients. All of the fiber and the pulp remain in the mixture after blending. Nothing is discarded, and the end result is usually a much thicker drink or porridge-like substance. This is the most common type of juicer. These usually have a large chute or chamber allowing you to easily and quickly load your produce. A spinning blade then grinds the material and spins it onto the mesh walls of the chamber. The centrifugal force of the screen then pulls the juice out of the fibrous matter, like a filter. The juice is then delivered through some sort of spout or spigot. Pros: The best thing about this type of juicer is how fast you can get your drink. They can also handle big pieces of fruit or veggies, which cuts preparation time down as well. These are also more affordable than the other types of juicers. Cons: Because of the speed of this type of juicer, sometimes they do not extract all of the produce’s potential juice. The pulp often still retains much of the liquid. These types of juicers also cannot extract juice from leafy greens or wheatgrass. Generally, these types of juicers are louder and generate more heat than the other types of juicers because of the higher rpm speed. Because of the introduction of heat and air to your produce, the oxidation that occurs does not allow you to extract the optimal amount of nutrients, antioxidants, and enzymes. These types of juicers operate using one gear or auger to chew up the fruits and vegetables. Once they are broken down, the juice is squeezed out and separated from the solid particles. The juice comes out of one area, and the leftover pulpy fiber collects in another container on the machine. Pros: These types of juicers will extract liquid from just about anything. Many people like to add leafy greens to their healthy, juicing lifestyle and not all juicers will pull out the moisture and nutrients like the masticating juicer will. These will even juice wheatgrass, which is a very popular nutrient-rich ingredient. Masticating juicers can also make products other than just juice. Acting more as a food processor with various attachments, these machines can make baby food, pasta base, buttery or creamy substances, and even grind coffee beans! The most beneficial aspect of a masticating juicer is that the parts do not heat up as much as centrifugal types of juicers. This allows for maximizing the amount of nutrients, enzymes, and antioxidants. Cons: Because this juicer has greater performance than centrifugal juicers, the cost can be higher as well. However, you might get more juice over time out of a masticating juicer than the centrifugal because of its efficiency, so you might save money in the long run. Another downside to masticating juicers is the amount of time needed to prepare the produce. Generally, the chute for inserting the fruits and veggies is quite small, so items must be chopped into small chunks prior to juicing. And, since the speed of the product runs at a slower pace so as not to heat your produce, your juicing time takes longer too. However, the quality of the product might be worth the wait to you. These juicers are generally the “higher-end” machines. 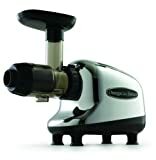 They are similar to masticating juicers, because they operate at lower speeds and utilize an auger to extract the juice. However, these juicers use two augers for optimum extraction during the juicing process. The produce is slowly crushed between two augers, which provides the greatest efficiency of separating juice from the pulp than both other types of juicers. Pros: The lower speeds and temperatures maximize the nutrient quality of the juice. They also extract the most juice of all three types, which saves money in the long run. The triturating juicer will grind and extract liquid from almost anything, especially the leafy greens. They can also produce buttery, creamy substances, pasta, or grind coffee as well. Cons: The slower speed can be the main downside, because it takes much longer than the centrifugal juicers. These are also the most expensive types of juicers. These are stationary machines that can perform many tasks, such as: mixing, pureeing, crushing ice, chopping, and grinding. They come in all shapes and sizes to suit your needs and blending desires. Pros: Large and small tasks can be handled in a blender. Most models come with blades strong enough to chop hard produce and even ice. 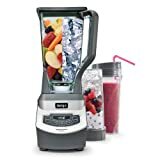 There is a huge range of blenders on the market, from commercial drink blenders to personal smoothie blenders. Anyone can find a blender within their budget. Cons: The cleanup can be annoying, since there are usually several parts that need to be washed. Blenders are a little bit loud as well due to the speeds of the blades and sounds associated with grinding and chopping. These are hand-held, long, and thin machines with small blades on one end. Pros: These handy tools are very easy to use and can be submerged into any bowl or pot of boiling materials. The latest models are cordless and battery operated. Older models can be plugged into the wall. They are very quick and easy to clean, with no detachable parts or products that could get lost in your kitchen drawers. Cons: Because of the small size of the blade, these tools will only blend soft produce, such as: sauces, soups, or shakes. As a hand-held tool, you won’t want to have to use it for a long time, because you will tire of holding it. These little kitchen wonders can also be a hazard due to the exposed blade, spinning openly on the bottom. Make sure all safety precautions are taken and children never get their hands on these! A juicer person is very much interested in the immediate health benefits of fruits and vegetables. A juicer person doesn’t worry about having to buy lots of fruits and veggies to end up with a small nutritious beverage. A juicer person also doesn’t mind having lots of excess “waste” after juicing. In fact, many juicer people prefer not to introduce the excess fiber into their diet and/or may even have a digestive concern that prohibits them from digesting lots of fiber. Juice enters the bloodstream much faster than blender products and allows the nutrients to immediately benefit the body. Lastly, they generally have much more time on their hands to prepare produce, juice the produce, and then clean up the mess. On the other hand, a “blender person” desires all that the fruits and veggies have to offer, especially the fiber. Fiber makes you feel fuller longer, so blender people can use their product as a meal. Blender people don’t have much time to prepare their produce; they just want to be able to throw their goodies in and make a delicious and nutritious concoction. Blender people also enjoy the multi-use functions that come with owning a blender. Juicers traditionally just make juice. However, the more advanced juicers, with additional attachments, can make pasta base, baby food, buttery or creamy mixtures, and even ice cream-like substances. Blenders are great for smoothies, milkshakes, blended drinks, soups, sauces, baby food, and so much more! Blenders beat juicers for the huge variety of food and drinks that can be created. From a nutritional standpoint, in the juicer versus. blender debate, most doctors highly recommend the juicer as a wonderful way to instantly inject a high concentration of nutrition into your body with fewer calories than what a blender drink could deliver. However, for the more realistic person with not a ton of time or money, the counter top blender is still the good old standby tool that can deliver quick and delicious beverages, and that also has the versatility to perform many other tasks in the kitchen. People often lump juicing and blending together. However, they are different enough for their differences to have inspired a great deal of debate. Juicing vs blending for weight loss is a hot topic, seeing as how many people specifically buy juicers and blenders because they are trying to change their diets. Juicing vs blending nutrition is similarly controversial. The Juicing vs Blending debate demonstrates how complicated nutrition and the culinary arts can be for dedicated individuals. To put it simply, juicing is distinct from blending because with juicing, the pulp of the fruits or vegetables in question is taken out altogether. When it comes to blending beverages, the pulp remains. The pulp really and truly makes all of the difference in terms of the texture of the beverage, and creates the distinction between blended smoothies and juices. There are some people that strongly prefer blended beverages to juiced beverages, and some people that strongly prefer juiced beverages to blended beverages. Even in situations where the same fruits or vegetables were blended, for some people, the texture can make all the difference. Blended beverages have a thick and creamy texture, while juiced beverages seem thinner and more watery by comparison. This makes them fundamentally different. People generally blend or juice fruits and vegetables, which are famously high in vitamins and minerals. People that juice or blend fruits and vegetables will be able to benefit from these fruits and vegetables one way or another. However, the question of whether it is better to juice or blend vegetables and fruits is open to debate. Ultimately, when it comes to blending or juicing, people should choose according to their personal preferences. Both juice drinks and blended smoothies offer health benefits, and it’s important for consumers to go with the beverages that they are actually going to successfully drink on a regular basis. Juicing and blending are both popular ways to create fruit and vegetable drinks from home. They will probably both reach similar audiences, and plenty of people own juicers as well as blenders. Juice drinks and blended beverages will both be relatively high in nutrients, depending upon the fruits, vegetables, and additional ingredients used to make them in the first place. Juices and blended smoothies have both been popular among people that were trying to diet and eat right. The pulp of the fruits and vegetables that people blend or juice is a good source of insoluble fiber. The fiber component of pulp has its own positives and negatives, depending upon a person’s nutritional goals. Everyone needs a certain level of dietary fiber, although a person’s exact fiber needs will vary. Plenty of people are going out of their way to increase the levels of fiber in their diets, so these people may benefit from using a blender and creating blended juice drinks. Apples are particularly good sources of fiber among fruits, and they work well as part of a wide variety of blended drinks. However, there are other people that are getting enough fiber from their overall diets or from health supplements. Other people are simply trying to increase their nutrient intakes. For these people, juicing may actually be better than blending. There is some evidence that fiber causes the body to absorb nutrients more gradually, and it may interfere with the absorption of other nutrients. The body does absorb sugar more gradually when fiber is involved, but that comes at a price. It is possible that health conscious individuals will have to choose to focus on either increasing their consumption of fiber or their consumption of nutrients in general. The loss of the fiber in juiced beverages does also have consequences, however. Juices tend to raise people’s blood sugar more than smoothies specifically because blended smoothies are comparatively high in fiber. The fiber can also help people feel more satisfied in terms of hunger, so people that are specifically trying to lose weight may want to choose smoothies instead of juices. Some fruits and vegetables taste better when blended, and some fruits and vegetables taste better when they are juiced, at least on average. It ultimately all depends upon a person’s individual tastes and preferences. The cleanup involved after using a juicer is usually greater than the cleanup involved with using a blender, because more is discarded. Different fruits and vegetables will differ in terms of the pulp that they produce, which will affect the texture of blended beverages. There are many established juicing recipes, as well as green smoothie recipes, which can help people find the right flavor combination of fruits, vegetables, or fruits and vegetables. Blending fruits and vegetables will produce a greater volume of liquid compared to juicing a similar quantity of fruits and vegetables, because less has been removed. People that get blenders and juicers of their own should experiment various recipes in order to find the blended or juiced beverages that they enjoy the most. However, just because they’ve gotten good results from blending or juicing a specific variety of fruits and vegetables doesn’t mean all of them will work just as well. Juicers and blenders were designed to be user-friendly. Using a blender is often a simply matter of loading the blender with the objects that the user intends to blend, and activating the desired setting on the blender itself. Juicers are often operated in a similar fashion, although it will depend upon the make and model of the juicer. Users will have to regularly get rid of the pulp waste that their juicers produce. Many people will measure out the ingredients they want according to an established recipe, and they will often chop and cut fruits and vegetables before blending or juicing them. The juicer vs blender debate is easier when it is about the ease of using blenders or juicers, where it will depend much more on the individual juicer or blender than the nature of the device itself. Blending and juicing are both great options for people interested in making healthy beverages from home. Blended smoothies and juices both have their positives and their negatives as far as nutrition goes. Ultimately, making the choice between Juicing vs Blending is about individual, subjective tastes. Breville BJE200XL Compact Juice Fountain Review: Drink to Your Health!